This is one of the prettiest pictures I've seen in a long time. And I don't think I need to caption this picture to tell you where I was last night. So, going back. 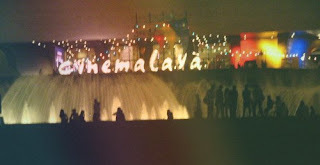 Cinemalaya. Well, the Cinemalaya Opening to be exact. To be perfectly honest, I did not expect what transpired when we finally got there. I did not expect it to be so much fun. I'd gladly do it over again just to feel the thrill and experience the awe I felt, entering the venue. Another confession. I dislike Filipino cinema. I don't watch Filipino films if I don't have to, and I'm dead sure that if this Cinemalaya wasn't required for class, I would not have attended of my own accord. However, like I've been saying, this experience was just so different. It totally dashed my previous notions and drew a distinction between the class of Filipino mainstream and Filipino independent cinema. And when I say different, I mean fantabulously amazing. So since we were together during the ride there, I needn't describe that. Haha. To make things a bit more interesting, I'll make a countdown of the Top 5 fun/interesting/memorable/wacky things we did, saw or experienced during the opening. #1. POSING LIKE A MOVIE STAR- We couldn't exactly party like a rock star in uniforms, so we did the next best thing! Camwhoring by the movie posters outside CCP was so much fun. It was a good thing there weren't many people when we arrived, or else people would have been staring at us as we went gaga over the movie posters and the beautiful backdrop of CCP. Then again, scratch that. We should give them something to stare at! Haha! #3. STAR-STUDDED CARPET- We didn't exactly have a red carpet, but there were PLENTY of stars that night, remember? Boy Abunda was there. So was Rosanna Roces. And I do recall some Kulasas going crazy over Kuya Bogs (sans the long hair). He really is a hottie. Haha! Not my type, though. Musicians only for me. #5. And the funnest thing about Cinemalaya? BONDING WITH YOU GUYS. (Cue Awwww!) Whether it was my perfect, Blairbanded hair or going crazy in the restrooms, this magical night was made more magical by the people I was with. As Joe Jonas would say, it was a B-L-A-S-T!! So there! My Cinemalaya experience in a nutshell. Pictures have been stolen from your multiplys. :) Haha! I can't wait to watch the other films. I've already printed out the sched. Which do we watch first? Text me! P.S. My hair was still AWESOME no matter what. P.P.S. I'm totally getting a gold Blairband.